Summary: Offering archeological proof for King David’s existence. PURPOSE OF ARTICLE: To expound on recent archeological discoveries that validate the existence of David. Did you know that many scholars think that King David never existed? 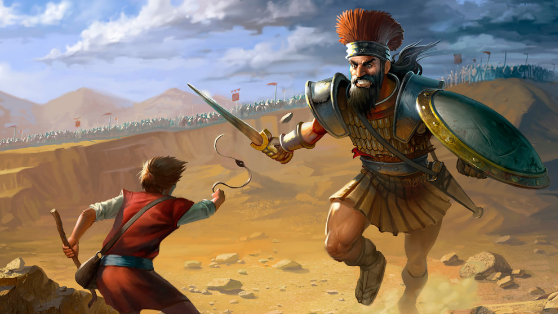 That’s right – the courageous shepherd who killed Goliath, fled from King Saul, united Israel under his rule, and conquered Jerusalem is thought by many to have been a total fabrication. Until 1993, the only accounts of David existed in the Bible. He was mentioned in none of the Egyptian, Syrian, or Assyrian documents of the time, and excavations of his city, Jerusalem, yielded no mention of his name. If David never existed, then we as Christians have a problem. 1 and 2 Samuel would have to be tossed out of the window as highly inaccurate records of history. The Psalms would have been authored by an unknown poet. Jesus’ recorded ancestry would be in error. Worst of all, Jesus himself, who viewed David as a historical figure (Matthew 12:3, Mark 2:25, Luke 6:3) would have been wrong. Thankfully, this is not the case. The result was an inscription originally erected by an Aramean (ancient Syrian) king before 800 B.C. In it, he boasts of a war victory against the cavalries of the “king of Israel” and of the “king of the House of David.”5 Scholars now agree that this is the first and earliest extra-biblical reference to the House of David, and that it strongly indicates that a king named David indeed established a dynasty in Israel that was still remembered well after his death. The Tel Dan Stele, now on display at the Israel Museum in Jerusalem,6 is significant because it was written by one of Israel’s enemies, who likely would not bring attention to a nonexistent or unimportant king of Israel. In the famed Louvre Museum in France lies the Mesha Stele, a basalt stone slab three feet high and two feet wide. The inscription on the stone consists of thirty-four lines written in ancient Moabite.7 The author? None other than Mesha, the ruler of Moab in the tenth century B.C. But what are we to make of claims that a complex government could not have existed in Israelite territory during the time of David? Hardin’s team conducted radiocarbon dating and an additional technique known as archaeomagnetism (determining the age of an artifact by studying the effect that the Earth’s magnetic field has on the surrounding minerals). The results were published in the December 2014 issue of Near Eastern Archaeology, and Hardin concluded: “We are very positive that these bullae are associated with the Iron Age IIA, which we date to the 10th century B.C., and which lends general support to the historical veracity of David and Solomon as recorded in the Hebrew biblical texts.”10 In other words, these seals defy claims that a complex government could not have been formed in tenth-century Israel. Rest assured that there is archeological proof for King David, the biblical hero who united Israel and became an ancestor of Jesus. Even though it took several millennia to find, this evidence proves once more that the Bible contains an accurate record of history and does not distort the facts for the sake of publicity or convenience. And as far as archeology is concerned, remember that time is a great vindicator. I have a feeling that there is still more to be discovered about the man after God’s own heart. Humphreys, Kenneth. “King David – The Boy Wonder.” Jesus Never Existed. N.p., 25 Oct. 2011. Web. 6 June 2016. Redford, Donald B. Egypt, Canaan, and Israel in Ancient times. Princeton, NJ: Princeton UP, 1992. Print. Brooks, Simcha Shalom. Saul and the Monarchy: A New Look. Aldershot, Hants, England: Ashgate, 2005. Print. McKenzie, Steven L. King David: A Biography. New York: Oxford UP, 2000. Print. Schniedewind, William M. “Tel Dan Stela: New Light on Aramaic and Jehu’s Revolt.” Bulletin of the American Schools of Oriental Research 302 (1996): 75. Web. “Samuel and Saidye Bronfman Archaeology Wing”. The Israel Museum, Jerusalem. Retrieved 26 August 2011. Albright, W. F. “Is the Mesha Inscription a Forgery?” The Jewish Quarterly Review 35.3 (1945): 247. Web. Kuruvilla, Carol. “Six Clay Seals Discovered in Israel Linked to Era of Kings David and Solomon.” The Huffington Post. TheHuffingtonPost.com, 20 Dec. 2014. Web. 06 June 2016. Good work. I did some research on the Tel Dan Stele in university. These sources, while hard to find, are worth it, especially given that they prove facts in the Bible. Thank you, everyone, for the compliments! This article was very fun to write. King David is my hero. thx for the article!! I have never commented personally on an article before, but this one is great. I know how much research it takes. We’ll keep praying for your ministry to grow in the Lord’s good timing. Thank you!! Very good article, Vinh. Love your writing style. The mesha stele is in the Louvre? cool! Great article by the way. The Mesha Stele indeed lies in the Louvre. You can see it to this day, a testament to the accessibility and longevity of this kind of evidence. This is fascinating. I’m actually surprised that there are so few mentions of him, but I’m glad these steles exist.